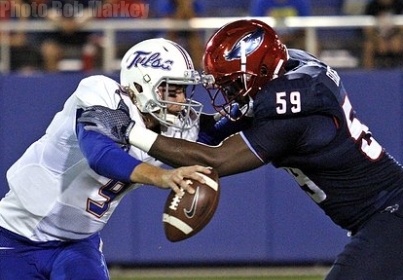 The Owls won their first game of the season Saturday night as they defeated the Tulsa Golden Hurricane 50-21. The Owls got a great performance from Jaquez Johnson as he was responsible for four total touchdowns in last night's must-win game. In the first two games, FAU was outscored 62-7 in the first half. Last night, FAU outscored Tulsa 33-7. Next up for FAU is a trip Laramie, Wyoming, to take on the Wyoming Cowboys. FAU broke out a new helmet for last night's home opener against Tulsa. Instead of wearing the traditional blue helmets, FAU sported shinny, red helmets, marking the first time in school history FAU has wore red helmets. Ever since Charlie Partridge was hired to be FAU's head coach there has been an emphasis on FAU's secondary school color, red. "#REDHOT" has been synonymous with FAU on twitter. Before the season started, Partridge held a meet and greet for fans to meet the football players and coaching staff. The name of the event: RedHot Meet & Greet. Partridge even changed his wardrobe for the occasion. "The student section was outstanding, almost at full capacity, which is why I threw the red pants on to honor them in the second half and to honor the entire crowd that came." Scout team players and walk-ons were all wearing red shorts during the game. "This was a must-win game," said William Dukes. Look for the red helmets to come out on such occasions only. Punt. Interception. Punt. Punt. Safety. Fumble. That was the result of Tulsa's possessions six out of seven times during the first half with one ending in a touchdown. After being maligned for their performance against Nebraska and Alabama -albeit against much bigger teams- FAU shut down Tulsa's spread offense for the better part of three quarters. D'Joun Smith returned to his playmaking ways, returning an interception for a touchdown and recovering a fumble as Tulsa was driving towards the end zone. The defensive line was relentless as Robinson Eugene (photo) forced an intentional grounding which led to a safety and Brandin Bryant forced a fumble. At halftime Tulsa Mustered 174 total yards on offense while running 40 plays. Roc Bellatoni's unit forced five three-and-outs, seven punts, and three turnovers for the night. Although the offense will get the praise after last night's performance, the defense set the tone for the night. - Trevon Cooley recorded his first career interception. - FAU's 362 total yards on offense in the first half surpassed the 345 total yards of output of their first two games combined. - Jenson Stoshak had career high 155 receiving yards. - Damian Parms had a career high 11 tackles. - Jaquez Johnson had a career long completion of 74 yards. - FAU recorded their first safety since 2009 against ULM. - FAU scored 50 points for the first time since defeating New Mexico St 55-10 last November.